Kevin Peacock won the Webbs AC match at Kingsland Fishery. All three lakes at Kingsland Fishery are in cracking form at the moment. Webbs AC fished the big lake on Sunday which saw Kevin Peacock put a fine 158lb 6oz to the scales for the win from peg seven, catching on the feeder and pole with meat. Vince Hull came second catching on pellet and sweetcorn for 124lb 14oz followed by Kay Beck with 120lb 13oz. Mark Cree is the man to beat over at Float Fish Farm Fishery after winning both the Wednesday and Saturday open matches on Two Islands. On Wednesday he drew peg 29 and caught all day to finish with 140lb 5oz. Runner-up was Tony Hudson with 107lb on peg eight followed by Alan Wiggins with 102lb 8oz. On Saturday he drew peg five and fished a feeder to the island to weigh in 148lb 2oz. Runner-up was Dave Schwinger with 140lb 13oz from peg 20. The Monday match on the Wagtail saw Mark Carter win from hot peg 22 with 130lb 5oz, followed by Alan Wiggins with 113lb 12oz from peg 11. 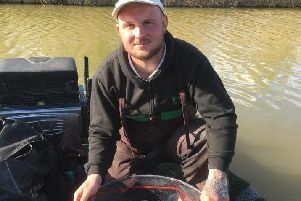 ‘Old School’ angler Dave Garner, who still prefers to fish a rod and line approach no matter where club fixtures take him, won the Fenland Rods match at North View Fishery at Gedney Hill. He is a master at meat fishing with a rod and reel combination and showed us all yet again how good winning with a huge 168lb 7oz. Runner-up was Mac Campbell with 119lb 13oz, followed by Tony Nesbett on 103lb 9oz and Callum Judge on 82lb 8oz. Rookery Waters, Pidley, Satuday Qualifier, Raven Pool: 1 Mark Pollard 117lb; 2 Graham Welton 107lb 4oz; 3 Richard Bond 96lb 2oz. Rookery Waters, Pidley, Thursday Qualifier, Raven Pool: 1 Jon Young 92lb 10oz; 2 Graham Welton 81lb 4oz; 3 Mike Whittaker 61lb 6oz. Over 60s Open, Rookery Waters, Magpie Lake: 1 Chris Saunders 185lb 10oz; 2 Roy Whincup 154lb 8oz; 3 Dave Lack 123lb.